The Zanzibar International Film Festival (ZIFF) is an annual film festival held in Zanzibar, Tanzania. It has been described by some as the largest cultural event in East Africa. Each year, some of the most captivating and cutting-edge cinema from Africa is screened in venues across the island. With 8 days of local and international discussion panels, workshops, 10 days of screenings of the best local and international cinema and evenings of musical concerts including a Gala each evening. ZIFF now gives 12 International Awards presented by 5 International Juries. It is estimated that 7000 western tourists came to Zanzibar to attend the festival with a total festival audience in excess of 100,000 with wide appeal across race, class and religions. ZIFF also puts on the island’s best parties. Live music, dance, DJs and performance across several venues! Eid Al-Fitr is a Muslim holiday that marks the end of Ramadan, the Islamic holy month of fasting. The religious Eid is a single day and Muslims are not permitted to fast that day. Eid is an Arabic word meaning "festivity", while Fiṭr means "breaking the fast". The holiday celebrates the conclusion of the 29 or 30 days of dawn-to-sunset fasting during the entire month of Ramadan. This is a day where Muslims around the world try to show a common goal of unity. On Eid Al-Fitr in Pakistan, Muslims read Eid Salaat then go to places to enjoy Eid. There are games, rides and different kinds of food in towns and villages. In the city, there is a lot of rush and traffic. In the morning, after Eid Salaat, Pakistanis' make dishes like Halva served with Puri bread or Naan. Later in the day, some people give away free food to their neighbors. Sometimes, when the mosque doesn't have enough space, people read outside. 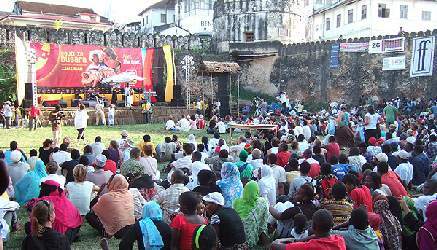 The annual Zanzibar Cultural Festival showcases the diverse traditions and celebrations of the region. This event is held annually in July, just after ZIFF. Performers come from many countries around Africa and the festival is marked with strong traditional customs and a rich heritage of culture. Zanzibari taraab music and traditional dances are performed by a rich ensemble of cultural troupes from Tanzania and abroad. Arts and crafts that celebrate local culture are exhibited and enjoyed. Around the archipelago, locals celebrate the cultural festival with workshops, cultural events and performances. Street carnivals in Stone Town, small fairs, and canoe races also take place. On the northern island of Pemba, the festival marks the annual bull fight, a remnant of Portuguese presence on the islands, where trained bulls prance after unarmed men in a humorous and festive version of the Iberian spectacle. A four-day-long celebration, although the festival is celebrated around the island, the village of Makunduchi, on southern Unguja, is the key focus of the ritual events and each year a large crowd gathers to attend the celebration. The origins of this holiday are Zoroastrian (a Persian religion older than Islam). It is a celebration of the New Year and some of the events include huge bonfires and mock fights. Together with the usual singing, dancing, feasting, and drumming that goes with all East African festivals, Mwaka Kogwa includes specific rituals destined to bring good luck in the new year. the women of the village dress up in their best clothes and proceed through the village and the fields, singing traditional songs about family, love, and joy. Then, the mganga, or traditional healer, lights a ritual hut on fire and reads which way the smoke is burning to determine the village’s prosperity in the coming year. Finally there is a large feast in which all guests are welcomed and considered a sign of happiness and prosperity. Bullfighting is a popular, traditional and annual sport in Pemba Island. Pemba bullfights are relic of Portuguse occupation of the island, which occurred during the 16th and 17th centuries. Drum beats, men and women sing local songs to make the event lively and spur on both bull and matador. It’s a purely sporting event and the bulls are not killed as Spanish do. There is no specific dates when the bullfightings are organized but usually during the hottest time of the year. This is between August and February. But some times it is done after clove harvesting or during the state ceremony such as Revolutionary Day of Zanzibar.